What does ARI do . . . Explore and inform . . .
4) to act as a center of innovative thinking and activity relative to the prehistoric and historic past of the region. The Aucilla Research Institute provides opportunities for researchers and students conducting fieldwork at paleontological, archaeological, geographical and ecological sites throughout the region. Such fieldwork includes inundated and terrestrial sites, with laboratory analysis and curation facilities provided by the Institute. 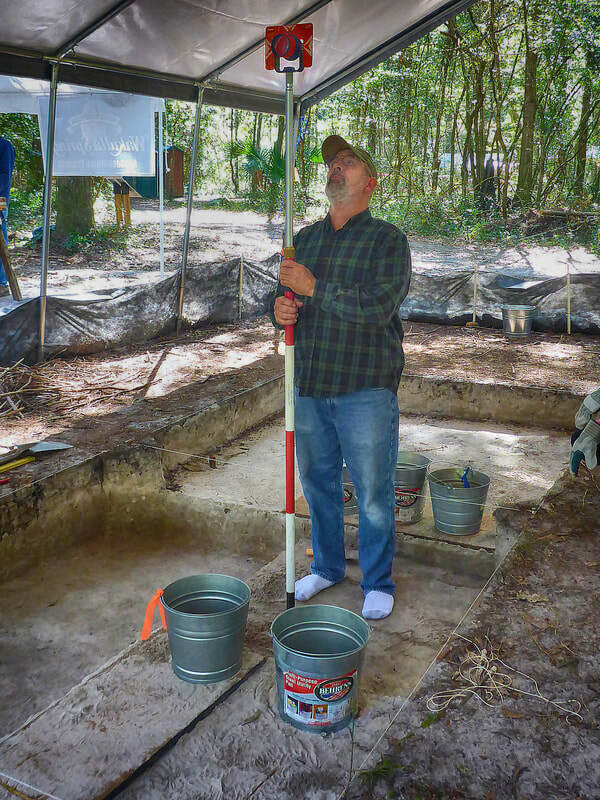 Of special interest to the Institute is Jefferson County and northwest Florida’s ecology, topography and hydrography, and archaeological and cultural history from 40,000 years ago to the present day. Taking a reading at a Florida dig site. The Institute’s educators and researchers interact with students and the general public, prepare exhibits for public viewing, and present their findings both in professional publications and public presentations. ​The Institute sponsors researcher lectures and professional conferences where findings from research are presented and discussed by both specialists and the public. The Institute was established to attract and promote original research in the earth sciences and natural history of the Big Bend area of Florida and to act as a center for innovative thinking and activity about these disciplines. ​The ARI has attracted a diverse and talented group of scholars from both the local community and several universities that have conducted a number of research projects through the Institute (PROJECTS LINK). To support such research, the ARI has facilities that include field equipment and a geometrics laboratory for scanning artifacts and for viewing, analyzing and plotting geospatial data (FACILITIES LINK). The Institute also has research collections from many archaeological sites available for use by researchers, including the Tall Timbers and Simpson collections. The Institute also conducts programs that enhance educational opportunities for students of all ages in our areas of interest. ​ARI and its scholars are creating a virtual museum (VIRTUAL MUSEUM LINK), begun a collection of professional papers (LIBRARY LINK), sponsored conferences (CONFERENCES LINK), presented papers at professional conferences (ROYAL SOCIETY LINK), and developed field education programs. The Institute has a strong Web presence for the dissemination of information and education, and the Institute has become a pivotal facility in developing the prehistory and history of the Jefferson County, Big Bend-northwest Florida region.